A low-budget Australian-made homage to the pulp B-movies of the 40s and 50s, THE 25TH REICH details the time-travelin’, Nazi-punchin’, robot-smashin’, spaceship-crashin’ exploits of five World War II-era OSS agents who are recruited to go forward in time and stop a future Nazi alien invasion. The jury’s still out whether that’s the most ridiculous or the most awesome premise ever, but the 3.1 rating on imdb speaks volumes for itself. IRON SKY, in comparison, has a 6.0 and is apparently the superior of the two Nazis-from-space movies that came out in 2012. The most important thing to take from that is we now live in a world where two Nazis-from-space movies came out in one year. My life is complete. The score for this opus, released a year after the fact by the ever-diligent MovieScore Media, comes courtesy of one RICKY EDWARDS, an orchestrator for DAVID HIRSCHFELDER with only a few TV credits to his name. 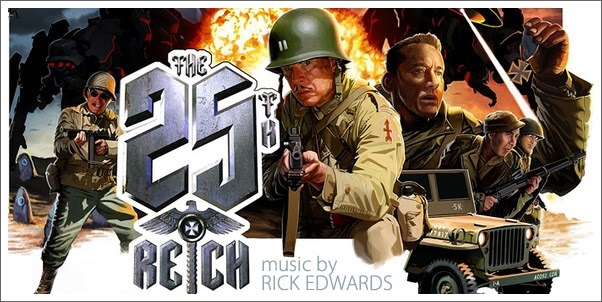 Things get off to an eyebrow-raising start with “The 25th Reich March” (1), which immediately slaps you over the head with an outrageous homage to the ultimate theme of evil, JOHN WILLIAMS’ “Imperial March,” right down to the first three harsh brass notes blasting on key. Given what kind of film this is, it’s safe to assume that it’s all done with a huge wink and a nod, especially when the interlude sequence throws in a theremin for good measure. You can’t help but smile despite (or perhaps because of) the obvious influence.